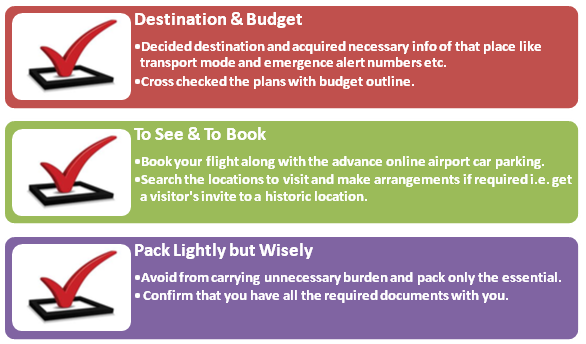 Home > Blog > How to Manage a Perfect Travelling Plan? How to Manage a Perfect Travelling Plan? Imagine going on a vacation to an amazing destination and putting your sweat and blood in planning it perfectly. Oh, you also remembered to make the online parking reservation with a source you already authenticated to be secure. You also accounted all the facilities you could enjoy. But still you are not satisfied as there is a feeling, a reminder that keeps trying to tell you that you missed something or overlooked it. Load the luggage, lock the house and drive to the Airport. Inform the parking provider service of your arrival. Handover your car to the Chauffeur at Meet & Greet point. Proceed towards the departure lounge. Proceed towards the meeting point. Receive your vehicle from chauffeur and off you go. If you have planned properly and arranged the bullet points in your mind clearly and correctly, it does not leaves much room for an error. This will be your own flawless travel plan as it evades all the issues that you could potentially encounter in your travels. Always travel well planned and make you parking reservation with Mobit Airport Parking to avoid hassle. Happy travelling….!!! Previous PostWould you like to use free Wi-Fi on the Flight?Next PostThe Demerits of ill-Planned Parking.